16 November is the feast of St Edmund of Abingdon, Oxford scholar and Archbishop of Canterbury, who died in 1240. 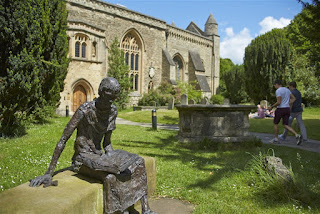 (It's also the feast of St Margaret of Scotland and one of the feasts of St Ælfheah, a predecessor of Edmund's at Canterbury two centuries earlier.) St Edmund had a long and somewhat turbulent career, as many medieval bishops did, and we have a mass of detailed information about his life - the cause of his canonisation was started very shortly after his death, which means that materials to support the cause were gathered from his contemporaries and those who had known him well. 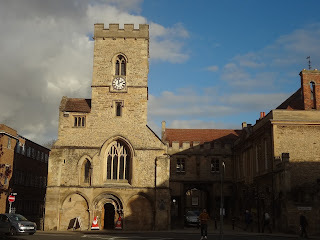 For me (quite selfishly), the interest of the hagiographical material about St Edmund lies in his early life, as a child in Abingdon and then a young scholar in late twelfth-century Oxford. It gives a vivid picture of Oxford in the early days of the university, which is not dissimilar, in some essential ways, from the work of universities and schools today. Education was one of the glories of the medieval church, and it's a shame that so many people today believe (on the basis of unthinking assumption, rather than fact) that the church in the Middle Ages was somehow 'anti-education'; nothing could be further from the truth, as St Edmund's life and story (and those of many others like him) demonstrate. It’s also rare to know so much about the early life of a medieval figure, or to have such specific details about their childhood that it becomes possible to visit and envision the scenes of their youthful experiences. 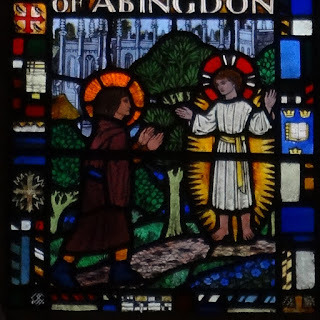 In this post I thought I'd share some of those early stories about Edmund, and take you on a visit to Abingdon, where they still cherish the memory of their home-grown saint. All quotations are taken from the thirteenth-century The Life of St Edmund by Matthew Paris, ed. and trans. C. H. Lawrence (Stroud, 1996). In Edmund's day the abbey would have been an imposing presence in the town, physically, institutionally, and psychologically. It was a major landowner here and for miles around, as well as the chief provider of education and healthcare. St Edmund was born in Abingdon around 1174, probably into a fairly prosperous middle-class family in trade. His parents were named Reginald and Mabel, and Edmund seems to have been the eldest of a large family; he had at least three brothers and two sisters, whom he took responsibility for after his parents’ death. Edmund's name might perhaps suggest that he was born or baptised on the feast of St Edmund of East Anglia (20 November); in the last days of his life he made reference to his namesake, telling his companions that after his death he would return to them on the feast of St Edmund, king and martyr, so perhaps he saw a link between himself and the Anglo-Saxon saint. These were relatively modest origins, and it was entirely through Edmund's parents' commitment to his education, and his own hard work, that he later achieved a position of eminence. It was Edmund’s mother Mabel who was the guiding and inspiring influence of his early life, especially his education. His father died when Edmund was young, and Mabel encouraged her sons’ education, supporting them first at Oxford and then at Paris. 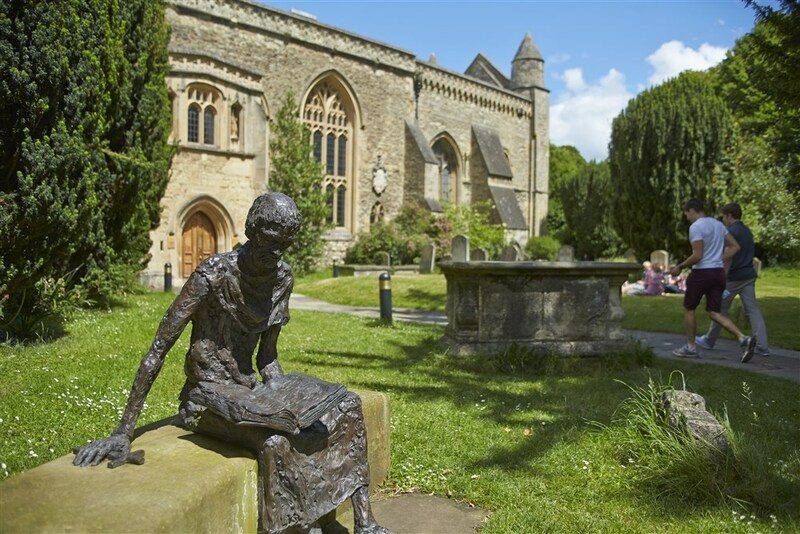 She was a particularly devout and determined woman, known for her works of fasting, almsgiving and prayer; ‘of all the widows of Abingdon she was said to have been the jewel’, Matthew Paris says. There's something evocative about a doorway which still stands and gapes, but no longer leads to the place it was built for. He remained long in that place, praying on his knees and asking the Holy Spirit to grant him the learning that conduces to salvation with the other virtues. As he grew older Edmund continued his education at Oxford and then at Paris, before coming back to Oxford to teach. He remained a serious and devout young man, and his hagiographer observes that ‘when as a youngster of more mature years he was put to the study of liberal arts, he proceeded of his own will along the road by which he had previously been led, being – as his name signified – blessed and pure’. (The Old English name-element ead- means ‘blessed’.) He engaged in strict ascetic practices to mortify his flesh, following the example to which his mother had encouraged him; when he was studying in Paris she sent him clothes (as mothers do!) along with a hair-shirt, urging him to wear it as a form of self-discipline. But despite this he remained, his companions recalled, ‘affable and kind to others’, ‘full of joy and gaiety’, and ‘a refuge of the oppressed, a consoler of the wretched and a most kind comforter of the afflicted’. When he became a Master of Arts and began lecturing at Oxford, he was known for going to hear mass daily before giving his lectures, ‘which was more often than customary among lecturers at that time’, comments Matthew Paris (or indeed any time, I suspect...). 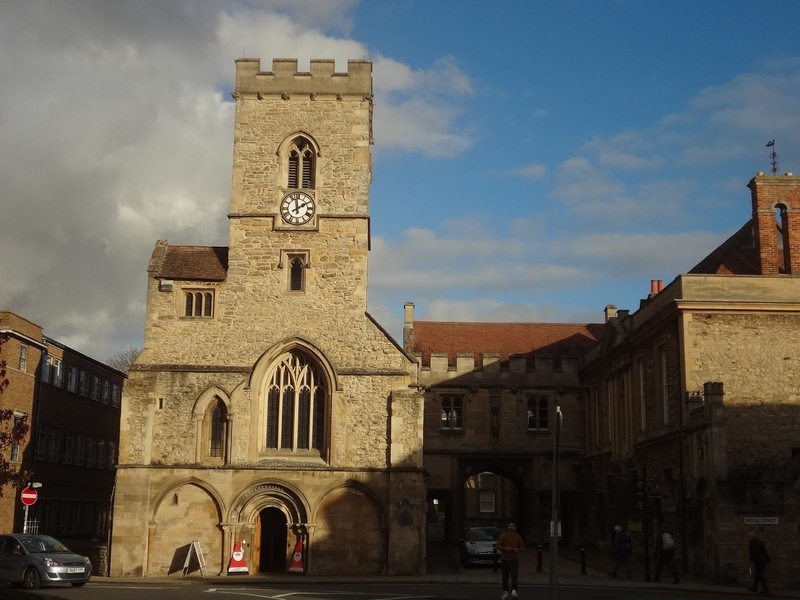 While he was still what we’d now call an Early Career Researcher, Edmund gave financial help to support poor scholars at the university (sometimes selling his own books in order to do so) and built a chapel in Oxford dedicated to the Blessed Virgin. The miracles of this phase of Edmund’s life are closely tied to his work as a lecturer: stories tell how he contended with the devil while making lecture notes for his students; how he healed one of his scholars from a serious illness; how he miraculously kept rainclouds away when he was preaching outside, and so on. He wrote, lectured and preached with great skill and eloquence; ‘when he lectured or preached, it seemed to his hearers that the finger of God was writing in his heart the words of life that flowed from his mouth like the river of paradise.’ He had so little concern for wealth that one of his colleagues testified that ‘when he received money from his scholars, he was in the habit of placing it, or rather tossing it, in the window, as if it were available to everybody’, and people would carry it away! Instructed by this dream as if by a revelation, he immediately transferred to the study of theology. This is a lovely story – a spur of parental guidance (disapproval?) from beyond the grave! The fact that she draws circles on his hand, as a mother might with a child, is a nice touch, echoing the sign Christ drew on Edmund's forehead in his earlier vision. 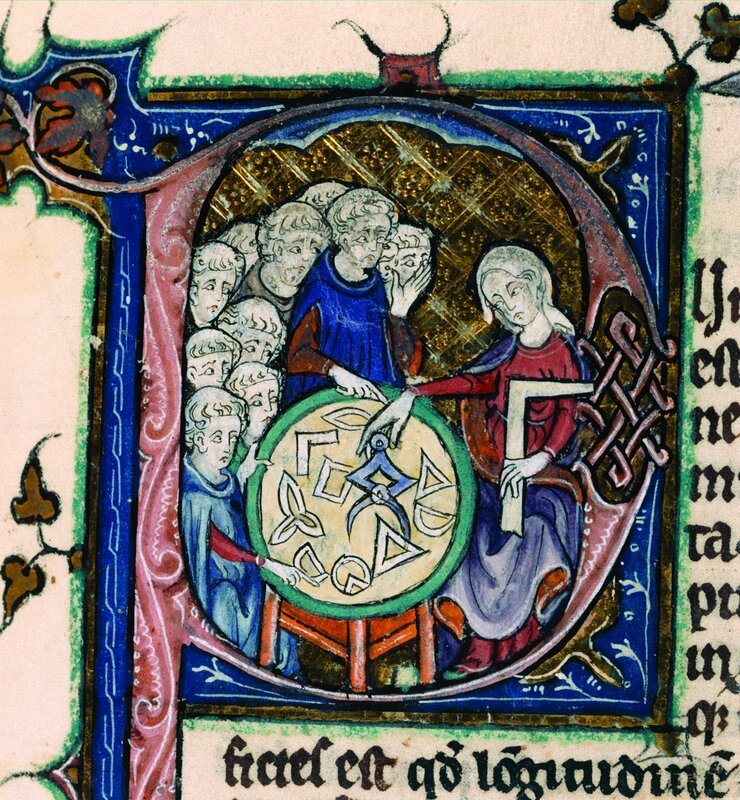 Mabel is not imagined here disapproving of geometry per se; the point is that this is basic knowledge, and it’s now time for Edmund to progress to higher and deeper subjects, through the study of theology. 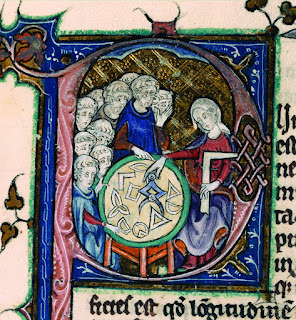 This story suggests something of the powerful bond between Edmund and his mother, enduring after her death; but it’s also relevant that in the Middle Ages educational subjects – from Boethius’ Lady Philosophy to Geometry and Theology, as in the image below – are often represented as female. Here the real woman Mabel is envisaged teaching her son as if she were a vision of Theology itself, guiding the promising student towards the Queen of the Sciences. This short poem is designed to be a spur to meditation on the Crucifixion, perhaps at the appropriate hour of the day when the sun begins to set. Apparently very simple, the poem is dense with meaningful wordplay: as the sun sets behind the wood, so Christ the Son is shrouded in darkness on the wood of the cross, the tree; that is, the 'rode', which means both 'face', and 'rood' (cross). And here we have another pair of a mother and her son, and their strong emotional bond: the poem encourages the reader to meditate and dwell on Christ's crucifixion by approaching the Son through the Mother, to feel compassion for his suffering as it is reflected in her grief (underlined by that wordplay on 'rode' - his cross and her face). We don't know who wrote this precious little poem, but it's possible it was St Edmund himself - and either way, how wonderful it is that this poem should be associated with a saint whose mother was such an important presence in his life. 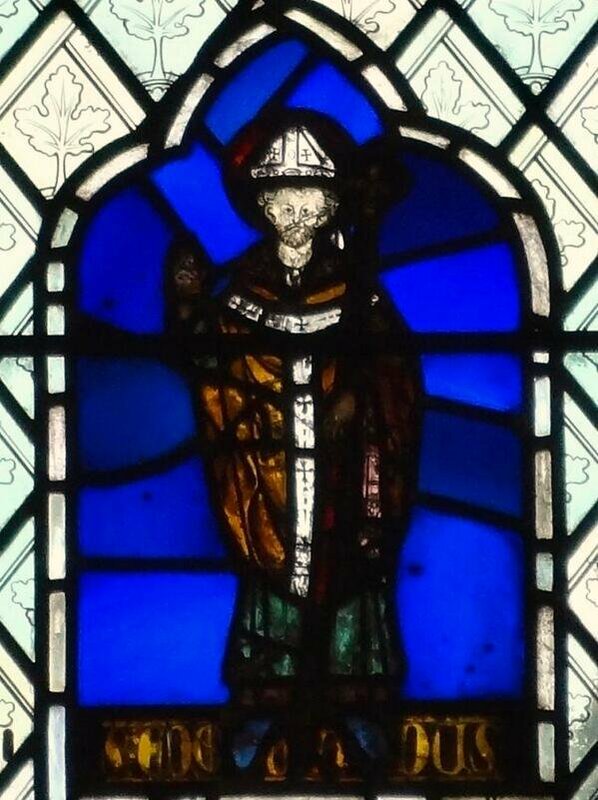 In 1222 Edmund became treasurer of Salisbury Cathedral, and began increasingly to preach outside Oxford; in 1233 he was selected (as fourth choice) to be the next Archbishop of Canterbury. His time as archbishop involved mediating in various political crises and disputes between Henry III and his barons, as well as conflict between Edmund and the monks of Canterbury; but it lasted only seven years. In 1240, on his way to Rome for a council with the Pope, he was taken ill on the journey. He died, and was buried at Pontigny - a long way from Abingdon and the banks of the Thames. After being fortified by the viaticum of salvation, he began to seem a little better, and became merry, as though he had been fed to repletion by the celestial banquet. Supported by a pillow so that he could sit, he looked serene and he joked with those standing around, telling them this proverb in English: ‘Men seth gamen goth on wombe. Ac ich segge, gamen goth on herte’; which is to say, play enters the belly, but now I say play enters the heart. The meaning of this epigram is: it is commonly said that a fully belly makes men joyful and ready for play; but it is my opinion that a heart fed by a spiritual feast produces a serene conscience, freedom from anxiety and joyfulness. In fact, he displayed such joyfulness and hilarity that those who were with him were quite astonished. The clump of trees in the last picture are growing on the site of Abingdon Abbey, which still takes up a large expanse of ground in the east of the town. Much of the site is now a public park (well, a bit of it's under Waitrose carpark). Standing here in the Middle Ages, you would have been looking at the west end of a huge church - apparently along the lines of the west front at Wells Cathedral. Can you imagine it? Lots of empty and evocative doors to nowhere here. I was in Abingdon most recently on August Bank Holiday this summer; the park was full of children and their parents, playing on the site of the abbey church, and the flowerbeds were bright with colour. I don't know what St Æthelwold would have thought of it all, but it brought Edmund and Mabel to mind.